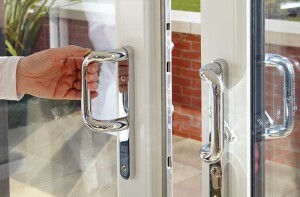 PatioMaster is strengthening its position as the UK’s market leader, by offering handles from the esteemed Hoppe Ltd as part of its patio doorset range. Door and window hardware manufacturer, Hoppe, is highly respected for its quality, innovation and performance. The company’s experience within the hardware industry spans over 20 years, and will contribute towards enhanced aesthetics, functionality and security in PatioMaster’s market-leading doors. With the Hoppe Resista® surface guarantee, offering a 10-year assurance of a scratch-resistant surface made of best quality alloys with a protective coating, the partnership promises a long-lasting good-looking door for PatioMaster’s customers. Produced to European standards, the hardware will also improve the security credentials of the door – particularly important when used as an external entrance system, for example, to a back garden or patio. Phil Duncombe, Product Manager at PatioMaster, said: “As the UK’s leading patio door manufacturer we take great pride in providing our ‘local service’ with the quality and assurance of a national brand name. “By partnering with Hoppe – a trusted brand whose products stand out for their high quality and fair price – we hope this will mean better margins for our customers, and better results in turn, for their homeowner customers. In addition to the attractive standard range, Hoppe offer a security version, which when used in conjunction with other components in the enhanced security specification, achieves PAS24: 2012 accreditation and Secured By Design status for registered Patiomaster Secure dealers.